Tri-County Animal Hospital utilizes a state-of-the-art digital x-ray unit. This allows us to instantaneously view the highest quality image for a more accurate diagnosis of your pet’s condition. If necessary, radiographs are sent to a board certified radiologist with results that are typically available in less than 24 hours. The image quality of a digital x-ray is much higher than a film x-ray and there is no time lost in processing the image. 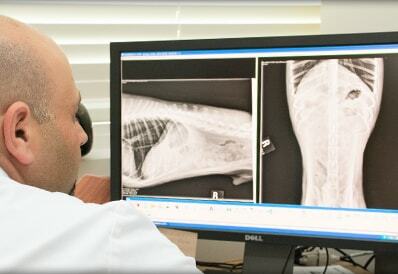 Because we are able to view the x-ray almost immediately we can diagnose and treat your pet rapidly. Radiation exposure to your pet is also minimized, as we use far less radiation for digital radiography. In addition, digital radiology is environmentally friendly because there are no chemicals to contaminate water systems.